In the 2013 post census report there was a radically different report when it came to LGBTQ++ people who attended Burning Man. It was more detailed than previous years, but one of the most notable factors was that queer presence was growing. Not everyone wants to be associated with the gayborhood. In fact, there are a number of active Burning Man participants that do not even know the gayborhood exists. there are queers who actively see out the Gayborhood and seldom venture beyond it for a variety of reasons. and there are some who call it the Gay Ghetto and dismiss the validity of the Gayborhood for all it is without rhyme or reason…. The gayborhood has, however, become an attraction at the burn. The carnival like, high visibility, feature inclusive has blossomed especially since 2012. Since the Gayborhood migrated into the 7:30 corridor we have been given a chance to really show our talent! 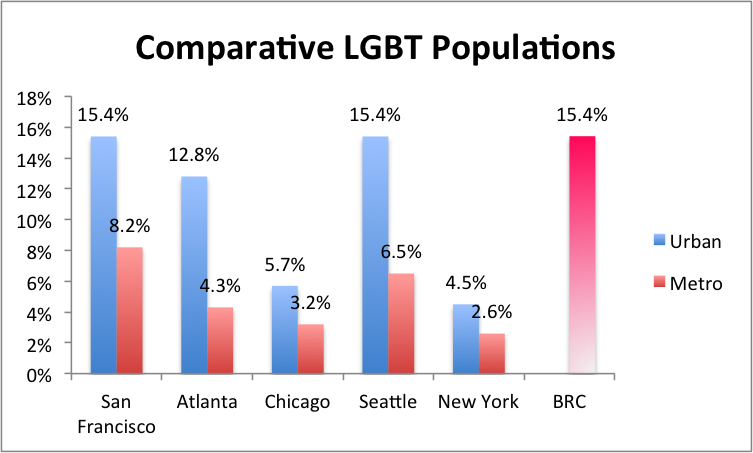 Below is a copy of the census report re:LGBTQ : to read the whole report click here. Black Rock City’s lesbian, gay, bisexual, and transgender (LGBT) Burners are 15.4% of the overall population, but that data alone cannot paint the wider panorama that is gender and sexual orientation on the Playa. Remember as you review the information that both gender and LGBT status is self identified, and that these questions were asked of all Burners, not just the subsection of those identifying as LGBT. Of all females, 15.6% identified as LGBT, compared to 14.1% of males. Of Burners who listed their gender as “fluid or neither,” 61.7% identified as LGBT. The largest percentages for the overall, male, and female samplings represented heterosexual Burners, however, for the group identifying as fluid/neither gender, only 17% of them chose heterosexual as their orientation. The overall data depicts the Playa as a largely hetero, but bicurious environment. The same was true for females Burners. However, the male population was largely hetero with the second-most reported orientation as gay, while the fluid/neither Burners were mostly bisexual and refused labels. If you compare Black Rock City to these cities in the United States, it is most similar to the urban areas of San Francisco or Seattle, which is representative of where many Burners come from, and where the event was originally birthed. How does this compare to your (other) hometown or nearest urban area? Burning Man is a community event and we are a distinct and contributing part of that. We are a part of that culture. We are also Burning Man.